Northern Ireland Water has set up major emergency incident teams in Belfast and Omagh to respond to customer complaints of flooding across the North. Hundreds of thousands of euro worth of damage was caused when a flash flood struck Ireland's highest town, Raphoe in Co Donegal, this afternoon. 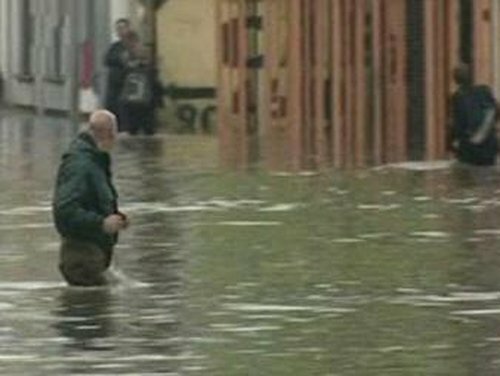 A freak storm also caused flash flooding in parts of Belfast and Omagh. There were similar problems in parts of Tyrone, Armagh and Lisburn. Some roads turned into rivers and the North's Fire and Rescue Service said it was inundated with more than 200 emergency calls in a 90-minute period. Northern Ireland Water, the British government-owned company set up in April to run the water service, said more than 100 staff and contractors were working at various sites sandbagging and starting a clean-up operation. They said they would work throughout the night to help householders whose homes had been flooded. However, they warned that with forecasters advising of further heavy rainfall, more flooding could result.